Hello, I'm Gayle and these are a few of my Raggedies. 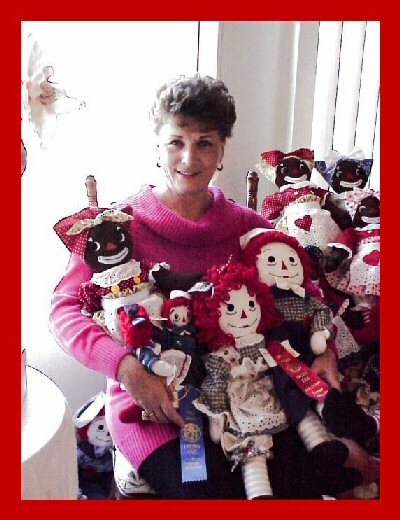 My dolls can now be found in Doll and Raggedy Collections worldwide, thanks to "YOU" my many loyal Collectors and Raggedy Friends! I think you will agree that the variety of character dolls I offer ….make for great conversation pieces and add a touch of “Variety” to your Raggedy Collections……..and can fill a spot until you are lucky enough to find an affordable “original” to take it’s place!!. I hope you will take some time to visit each of my pages....Links for each page are listed on the left-hand side of each page. Most pictures can be clicked on to enlarge and many will have a "Link" below them that will take you to a page dedicated to that particular character. It is my sincere hope that my website will instill that love of Raggedies in each and everyone of you as well ! I have spent many heart-felt hours putting together all of the information I have gathered from a variety of sources over several years . I wanted to place it in ONE location for others to learn all that I have learned about our delightful little red-headed Raggedy Ann and her many friends. You might also want to read some of my other Guestbook entries, my Customer's Letters, or my eBay Feedback or maybe you would like to know a little more About Me.....they are all just a "Click" away! My dolls are meticulously designed and created to capture the whimsical nature and charm of these delightful "Raggedy" characters from the past!! Bringing to life......Reproductions of the original versions by Volland, Exposition, Georgene, Knickerbocker, Silsby, and Molly-'Es, Raggedy Ann and Andy and their Best Friend, Beloved Belindy & her counterpart Benji. As well as my own designs and creations of other Gruelle's Raggedy Ann storybook characters like Eddie Elephant, Eddie Elf, Pirate Chieftan, Uncle Clem the Scotch Doll, Percy Policeman, Henny and Frederika the Dutch twins, Cleety the Clown, The Nice Fat Policeman, Snitznoodle,Wooden Willie, Mr.Minky and The Camel with the Wrinkled Knees........and a variety of sizes and styles of Raggedy Ann and Raggedy Andy. Lots of New Characters have been added in the past few years ! ! ! Visit my NEW "Coming Soon" page to see pictures of these characters and to learn about Each one of them! You will also find a link to a "special page" that will tell you all that I have learned about EACH of these characters! Even MORE New Characters Created ! ! ! From the Rudolph the Red-Nosed Reindeer movie "Island of Misfit Toys".....check out her page! And Mr. Twee Deedle, who celebrates his 100th Birthday this year!! Visit my What's New page to see all of my latest Creations! Due to popular request...... I am working on plans to create an entire series of ALL of my Characters in 7 1/2 inch, for those of you who have LARGE Collections and do not have room for the 20" size. The price will either remain the same, as they will still be my "Original Designs" and it is more difficult to work with the small pattern pieces. Each doll is an Heirloom Quality Collectible Treasure.........and will add that "One-of-a-Kind" distinction to your Doll or "Raggedy"collection!